A framing nailer is a tool commonly used by professional contractors who are responsible for building, rebuilding or remodeling homes. A nailer device has a nail cartridge where standard nail packs can be slotted into position and locked in place. Nails that get stuck in the mechanism can usually be moved quite easily and with a minimum of downtime. An effective Best Framing Nailer will be one that can access facing walls and corners just as easily. Firing a single nail or enabling a sequential nailing process, and then pushing down on the front claw and depressing the nail trigger, is all that it takes to push a nail into a piece of wood or other building material. These nailer products usually function using an air compressor, which is often sold separately, that is attached using an air hose. Once the air compressor is turned on and the air hose attached, with nails inserted into the nailer’s cartridge, the nailing process can begin. Not every framing nailer is effective for all tasks. Some are best used to finish up a job, whereas others are useful power tools on a building site where new homes are being erected. See our Best Framing Nailer reviews below to take a look at the best framing nailer for the money, the best framing nailer on a budget, and the best overall nailer. This is considered by us the best framing nailer on the market! The Freeman P4FRFNCB Framing/Finishing Combo Kit with Canvas Bag, 4-Piece is our overall winner in the Best Framing Nailer category. This product includes three nailers and one stapler in a bundled package. 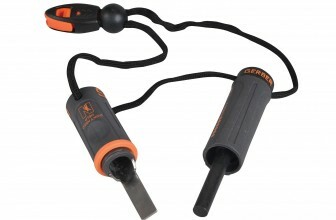 Each tool uses magnesium for lightweight construction and easier use with one hand. The stapler power tool is an 18 gauge 1 ¼-inch narrow crown model that sports a nose that can be released quickly. The first framing nailer is a full head nailer with a 21-degree angle that uses 20-22 degree round head framing nails that are plastic collated. The nails can be between 2-inches and 3 ½-inches in length. The second framing nailer is a 15 gauge one at a 34-degree angle finishing nailer. It can handle nails from 1 ¼-inch to 2 ½-inches in length. The third nailer is a brad nailer which is capable of using 18 gauge brads from 5/8-inch to 2-inches in length. It has a quick release feature too. The design runs without the need for oil. Once the air tube is fitted, the air filter helps avoid debris from clogging up the tool. The 360-degree exhaust can be moved to point away from the user. The no-mar tip avoids damaging the work surface when adding nails or staples. Nails can be adjusted for depth to push nails into building materials only as far as is needed. The largest PFR2190 frame nailer has an anti-fire mechanism to avoid attempting to fire when no nails have been loaded. Several of the products have a quick release option to remove jams quickly reducing downtime considerably. A canvas bag is also supplied to carry all the tools together. These tools are intended for use mainly by contractors and home users who have a great deal of remodeling to complete.The tool set is covered by a 7 year limited warranty. The Hitachi NR90AE(S) 3-1/2″ Plastic Collated Full-Head Framing Nailer is the winner in our Best Framing Nailer for the money category. Equipped with a non-slip elastomer grip trigger. Ergonomically designed simple flip actuation switch allows for quick transitions between sequential and contact nailing. The NR90AE(S) model is an affordable, ergonomic framing nailer that manages to pack many features into a price point that will make sense for many people who need a good collection of power tools. Starting with the trigger grip which uses an elastomer material to avoid slippage and continuing with a dual mode actuation feature, which can either be selected as contact fire mode or sequential firing model at the flip of a switch, this model is easy to hold and use. Weighting only 7.5 pounds with a good balance to weight ratio that helps reduce the weighty feel in the hand and during use, this Hitachi framing nailer is an ideal tool for accessing tight corners, where a larger framing nailing power tool simply would not fit. The nose has a claw tip which is made from strong material to avoid excessive wear during nailing sessions. The claw tip will also reduce issues of accidental slippage during a toe nailing action. The 21-degree angled magazine for holding nail packs is build from two pieces of aluminum, which have been anodized to reduce corrosion or wear and tear when used outside the property, and to improve its appearance. The five year warranty from Hitachi provides assurance about the product’s quality and makes it even better value for money. The NuMax SFR2190 21 Degree Framing Nailer is the winner in our Best Framing Nailer on a budget category. Ideal for Wall Framing, Roof Decking, Wood Fencing, Sub Floors. 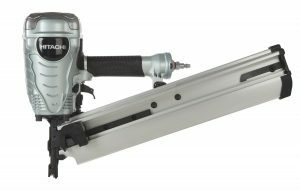 This framing nailer is made from magnesium, which ensures that it stays lightweight at just 8.5 pounds. The driver blade is made of re-inforced steel as a single piece that helps to forcefully drive each nail into the building material like a timber beam or a wall. Whether using this nail power tool to frame a wall, add wood fencing, some roof decking or floorboards, it is designed to be robust enough to handle varied tasks over time. Nails are held at a 21-degree angle. The nail rail can hold nails from 2-inches right up to 3 ½-inches round head nails. The tip, which touches the material surface, is a no-mar tip type, which ensures that the surface doesn’t get damaged when firmly placing the tip to the material being nailed. The nail magazine is made of aluminum, which has a simple loading mechanism. Simply slide back the pusher, fit the nail pack in place, and then let the pusher move back to push the nails to the top of the magazine ready for use. There is a handy air filter that protects the tool from becoming clogged with debris that is created when nails get pushed into material and debris shoots out. A tool depth mini-adjustment selector allows the owner to change how deep each nail should be pushed. 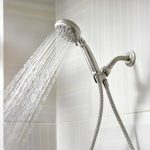 The handle is rounded with a rubber surface for easy grip. There are two triggers supplied which offer two modes; single action and sequential firing modes. When reaching the final 5 nails loaded into the nail magazine, a safety press feature is engaged as a protective measure. A framing nailer is used by both professional contractors and do-it-yourself types who like to try remodeling their home largely on their own. Rather than deal with having to hammer every single nail into place while attempting to hold a piece of wood in position, an air-powered framing nailer can make light work of the same task. Just move the steel claw into position and depress the easy grip trigger to air-push a nail through the timber beam (or other building material). Some nailers will actually have two modes to help with putting single nails into building material or a collection of nails along a straight line as a series of actions in a sequence. The latter can save even more time when using a framing nailer tool to place one nail at a time, in an organized sequence, to complete a task. The rapid fire nature of using a framing nailer, which will fire when pushing down on the metal claw and then depressing the trigger at the same time, cuts down project completed times. These tools are ideal for putting together small projects like renovating a home on spare weekends, while avoiding an injured thumb when trying to hammer a nail into place. Just the pain avoidance over the years of not having to use the hammer that so often hits a finger or thumb, instead of the nail, makes the budget category winner worth every cent. 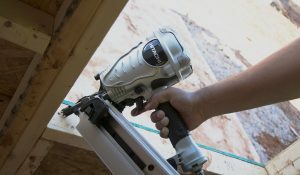 Framing nailers can be smaller power tools that are designed to place small nails to finish off a corner or they can be commercial tools that are air-powered and robust enough to help build complete houses. Not all framing nailers are built for the same purpose and it is important to bear this in mind. The price of the product is also a determining factor for whether the tool will be durable enough to last. Commercial framing nailer tools are often used on a daily basis, for years at a time. Cheaper framing nailers might be used daily for a house project covering a few weekends, but then the tool might be put away for months at a time. Therefore, the requirements of this type of tool are different, depending on its intended use. The metal claw that helps line up the nailing tool and hits the surface of the timber and other building materials over and over, is worth considering. Is it made of strong enough metal to be durable over time for how the tool is intended to be used? Is it easy to remove and replace when broken? The nail cartridge protrudes out of the nailer, often at a 21-degree angle. 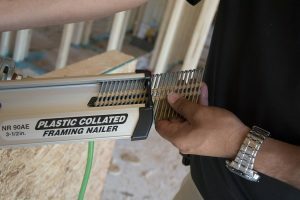 Some nailers allow for easy loading of nail packs, with the slotting in of the nail pack, sliders to push the nail pack along the internal slider mechanism, and a fastener to lock the cartridge back in place. Some other nail cartridges will be more basic, but are still very usable. It is helpful if the cartridge is made using a strong material and perhaps is anodized to protect it from the elements. These cartridges take a fair amount of wear and tear along the way, so they need to be durable too. A dual mode is most useful with nailers, because they allow single nail delivery and continuous delivery of nails one after the other. Using the continuous process can be a considerable time saver. Sometimes this feature is offered as a switch, other times there are two triggers included with the product, to swap out, as needed. 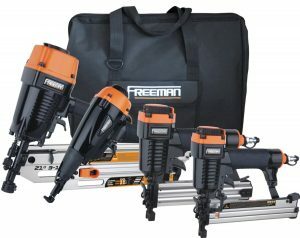 The Freeman P4FRFNCB Framing/Finishing Combo Kit with Canvas Bag, 4-Piece is our overall winner in the Best Framing Nailer category. The Freeman package is a great bundled package in a large, canvas bag. It stores a stapler, and three types of nailers. The construction of these tools uses magnesium for strength and lightness. The stapler has an 18 gauge, 1 ¼-inch narrow crown. It has a nose that can be released quickly to make it easier to adjust. The first framing nailer is a full head variety with a 21-degree angle. It can use 20-22 degree round head plastic collated nails, between 2-inches to 3 ½-inches in length. There is an anti-firing mechanism built-in to stop attempts to fire a nail when there are no nails loaded yet. The second framing nailer is a 15 gauge one, with a 34-degree angle. It is mainly used for finishing up projects. It can load in nails that are between 1 ¼-inch to 2 ½-inches in length. The third nailer is a brad type that uses 18 gauge brads and takes brads from 5/8-inch to 2-inches in length. These power tools have been designed not to need regular oiling to keep them in working order. All the tools are air-powered through an air tube connection from a separate air generator (purchase separately). An air filter helps isolate debris from clogging up the each tool. The exhaust turns 360-degrees and can be pointed away from the user. When lining up the tool to work on the material, the no-mar tip prevents damage to the surface where the nails or staples will be inserted. The depth can be adjusted to change how deep nails are pushed into wood and other materials. Quick release mechanisms are a repeated feature of several of the power tools in the collection. This helps to remove jams. This tool collection can be used by either contractors or home users. It is certainly not overkill for home users to buy this product if they want high quality, long lasting framing tools, with a stapler thrown in for good measure. The tools are strong enough to push nails into the most stubborn of building materials. The tool set is covered by a 7 year limited warranty, which really goes to show how much Freeman stand behind their products. The Hitachi NR90AE(S) 3-1/2-Inch Plastic Collated Framing Nailer is our winner in the Best Framing Nailer for the money category. 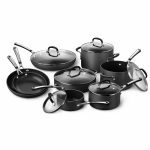 This model hits the spot as both good value and offering a good range of quality features. It is the bare tool, air-powered, and does not come with a portable air compressor, which needs to be purchased separately. Firstly, the trigger, which is important to avoid accidental nails being shot out, uses elastomer over the grip to provide a non-slip feel. There is an easily reachable flip switch to control the actuation between two modes of operation. The first mode is contact nailing, whereas the second one is a sequential mode, which makes it much easier to place a series of nails in a row or along a straight line without needing to fiddle unnecessarily with the controls. The claw tip that comes with the nailer helps to line up nail positions, prevents early excessive wear to this tool, and helps keep the nail claw in the required position without it slipping out of position before the nail has been placed. The aluminum nail magazine is anodized to reduce wear and provide protection for outdoor use. It comes in a convenient two piece assembly, which is easy to disassemble when needed. A depth adjustment dial can be modified without needing any tools to do so. This will save time for any builder who uses this power tool. Whether wanting to flush drive nails or countersink, this is possible when using this powerful tool with many types of building materials. 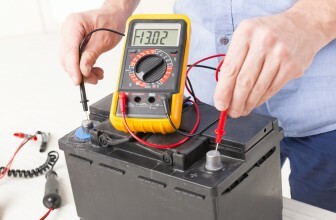 The pressure when using a compressor is steady and constant. It is easy to attach and detach the air hose without difficulty. This Hitachi NR90AE(S) is light enough at 7.5 pounds. It has an excellent power to weight ratio and the tool’s design manages to distribute the weight quite nicely. 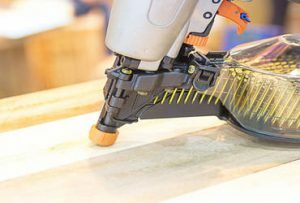 The standard NR90AE(S) package includes the framing nailer and a pair of safety glasses, which is a good idea when working with any type of nailer. This nailer is a useful tool when wanting to add finishing nails, around 2-inches, to a project. 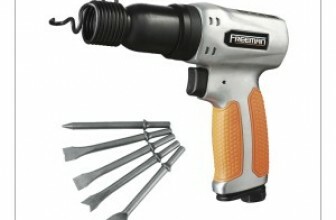 This makes this power tool ideal for finishing off areas and putting together small projects. In use, this framing nailer rarely had a jamming problem and only occasionally will cause a double firing to happen. For the most part, it is a useful tool for small jobs by a handyman who needs to be able to complete a framing task without the need to heft around something more substantial. Stick with brads that are 0.148 or slimmer, and they’ll work well in this nailer. Nailing around corners is easier with this Hitachi model than some other nailers. In terms of durability, commercial nailers have found that this tool can be used for several years, reliably, day in, day out. It is also possible to get the tool repaired should it be dropped accidentally. This framing nailer is intended for use to add garden fencing or siding, framing, roof sheathing, wall sheathing, and to create wooden boxes. It will be more suitable for home users than commercial users. This nailing gun is created using die-cast magnesium, which helps to keep the weight down to 8.5 pounds when the nail magazine is added. The steel drive blade, which has been heat treated to increase its strength, will forcefully propel nails into the target timber or other building material. The air tube gets plugged into this nailer from the air generator, which needs to be purchased separately. The functional air pressure with this model is between 70-115 PSI, which many air pressure generators can deliver. Nails are held in a 21-degree angle. The nail cartridge is made out of strong aluminum. It has an easy to use nail loader with a basic pusher that is pulled back to enable nail packs to be inserted into the nail cartridge. With the nails safely placed inside, the pusher can be released, which will move the nails up to the top most position ready for use. The nail cartridge can hold nails from 2-inches up to 3 ½-inches round head nails. Nails should be round headed ones, often with a plastic coating, rather than a paper coating. The tip, which makes contact with the item being nailed, is a no-mar one that helps to avoid scuffing or marking up the surface being nailed. The tool depth selector assists the owner when changing the depth that the nails will be air-pushed into the building material. The length of a nail can be matched to the amount of air pressure used and avoids overuse of the air pressure generator. The handle for the nailer is round with a rubberized surface to help with a strong grip. There are two triggers that are interchangeable. The first is intended for single trigger actions to push one nail at a time. The second, a sequential trigger, lets the user add nails one at a time in a planned sequence. One potential negative with this model is that when wood is damp or has been treated and retains some of the moisture from the type of wood treatment applied, the nails will not penetrate the wood as deeply. Therefore, users may wish to wait until the wood has dried out fully before using this nailer to complete the building task. An air filter is included, which avoids debris dislodged when a nail is pushed into building material, getting stuck in the mechanism. There is also a hefty exhaust that expels the debris that gets collected during use. NuMax offers a one year guarantee on the main body and only 30 days on the parts that are wearable. 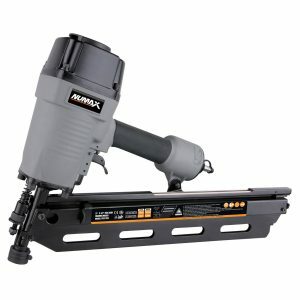 Some people are interested in purchasing a combined nailer / stapler in a single power tool. This is generally not the best idea, because typically such a tool is not the best at either stapling or nailing. For this reason, it is best to buy the right tool for the job. Be sure to be protected from accidents. Even when using a framing nailer power tool, it is possible to become hurt if not paying attention. Professionals tend to get hurt 1/5 of the amount of home users, so clearly more attention needs to be paid by weekend users when using any power tool. Use plastic protective safety glasses. An air generator is required for each of these air-powered tools. They will not function without one, which needs to be purchased separately. For contractors who have a larger budget, the Freeman 4-tool package is the best option. It wins on flexibility, durability and features. For home users who don’t require a stapler tool and several different sizes of framing nailers, the choice is less clear. Both the Hitachi and NuMax models are good tools, but for both build quality and durability, the Hitachi has the NuMax beat. The NuMax is still a popular model for home users though, because it delivers much for a fairly low price, but it lacks the 5 year guarantee of the Hitachi model.